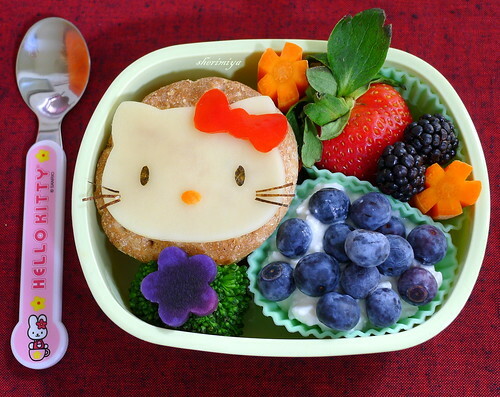 Hello Kitty Pizzawiches Bento, a photo by sherimiya ♥ on Flickr. TinySprite gets pizza today, but in little mini sandwich form. There's grated cheddar, shredded spinach and mini pepperonis inside two toasted whole wheat sandwich thins for her, with a cheese/carrot/nori/red pepper Hello Kitty face to greet her. I squeezed in some steamed broccoli, Okinawan sweet potato, carrots, a cup of cottage cheese with blueberry topping, a big strawberry and some blackberries. Since her cast came off yesterday, we're bulking up on dairy and other calcium-rich foods to ensure maximum new bone growth. It shouldn't be hard, since she's a real cheese lover. Next week there's an exciting surprise coming up on Happy Little Bento: it has to do with cool new bento stash, and there's even something in it for YOU too, so be sure to tune in! Yay! So happy the TinySprite is all mended! A super cute Pizzawich (Haha great new word, going to use it!) And a Bento Haul...ooh so excited! Well, nearly mended. Bone is still healing for the next few weeks. The trick will be to get her to keep her activity low even though the cast is off. Thanks berrygirl. This bentohaul is a good one indeed! This is so sweet Sheri! Why there is no bento when I was a kid? How is TS doing? Still wearing her cast? I think I'm going to make a HK bento for myself to eat at home, in private, one of these days... hehe. Thanks Lia! She just got her cast off yesterday, although the bone is still not completely healed, so I'm still a little nervous about injury. So kind of you; thank you Ming! You're always so sweet; thank you Jenn! I'm so glad her cast came off and she's moving on! I've missed a few of your bentos this past week and I especially love the squash spaghetti one. 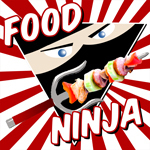 Also the wonton one.. oh who am I kidding? I just love them all. lol. Awww, you're the best. Thank you Chantale! I am so upset because I don't know how to do this! Happy to hear her cast is finally removed! Your Hello Kitty pizzawiches are the cutest, and I pinned it to use as reference for my future use. =) I'm excited about your surprise next week! I always love your colourful bentos and those blueberries look delicious!! Aaaag! This is wildly adorable! Did you use a cutter to make the HK face? I am so glad to hear that Tiny Sprite is recovering. I had to wear a cast on my arm after an injury when I was about 13 years old, and honestly I thought it made me kind of cool. Kids see things a lot differently than parents. I hope she is back to her old self soon! Thanks Sonoma! Yes, I have a large HK cutter that came with eyes and bow cutter too. It is a relief to have the cast off and see her begin to use her arm again. Whew! Appreciate your nice comments!